Today was even better than yesterday. I woke up feeling pretty normal, but I felt better and better as the day progressed. This afternoon I enjoyed a deep feeling of euphoria for about 2-3 hours, the same feeling I remember from my first raw trial. I did get some good news today that certainly had an effect, but I was feeling really happy even before then. I feel even better than I did before starting this trial. I did a solid 30 minutes of aerobic exercise at the gym this morning but nothing out of the ordinary. This morning my weight was back up 1.4 pounds to 183.0. I’m still down 3.0 pounds since January 1st. Since I’m eating several pounds of food per day, I expect to see some fluctuations like this on a day-to-day basis. The long-term trend is what I’m most curious about. Some people expressed concern about whether it’s possible to maintain a muscular build on a raw diet. This diet can make people very lean by dropping body fat, but it’s certainly possible to build muscle on this diet too if that’s important to you. For a fascinating example, check out the story and photos from raw foodist Shannon. In the forums, people have been sharing other links to raw athletes as well. I think the reason we don’t see more muscular raw foodists is simply that raw foodists are such a tiny percentage of the total population, at least in the USA, so there probably aren’t very many raw foodist bodybuilders out there. I was very hungry upon returning from the gym, so I put this together in a few minutes. 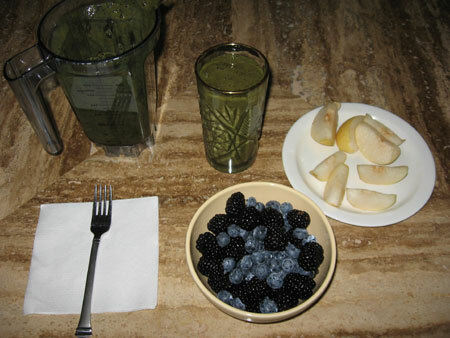 I focused on eating the solid food first, and then I took the smoothie to my office to finish it while working. It’s easy to get a lot of calories by having a smoothie to sip at my desk. I snacked on the bananas and clementine throughout the morning while working. 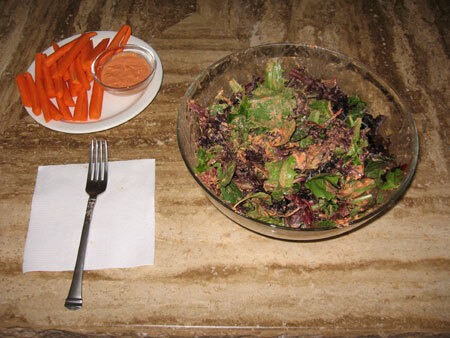 I made a simple mixed green salad with tomato-tahini dressing and carrots on the side. I really enjoyed this meal. I like having a fruit meal for breakfast, a veggie and fat meal for lunch, and more fruit for dinner. This may not be ideal for digestion (I’ve been told it’s best to eat the fat as the last food of the day), but it works. I like having something non-sweet at lunch. The dressing I made came out too thick, more like a dip than a dressing, so I should have added a little water. But it worked as a good dip for the carrots too. The softer mixed greens are faster to chew than the crunchier salad veggies like romaine and cabbage, so this meal didn’t take unreasonably long to eat (about 20 minutes). For dinner I quickly ate 3 bananas (330g) before heading off to my Toastmasters meeting. 2 more bananas (236g) and an Asian pear (210g). It’s nice being able to eat as much food as I want. I’m starting to feel comfortable eating larger quantities per meal. I think I’m beginning to get the hang of this way of eating. It didn’t take me nearly as long to prepare my meals today as it did on Day 1. I seem to be getting into a good groove. I don’t think it will be too difficult to stay 100% raw for the rest of the 30 days.